Fair Winds Press, 9781592336982, 208pp. Better communication is right around the corner with Teach Your Baby to Sign. You may feel like you can't possibly be any closer with your young child, but the truth is, you can--through sign language. The gift of signing helps children communicate well before they have the verbal ability to do so. Whether you have a young child who hasn't started talking yet, or a child with special needs, signing can open the door to better understanding and connection. 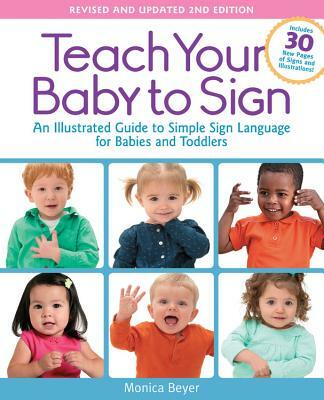 In this revised and updated edition of the original Teach Your Baby to Sign, you'll find more than 200 easy-to-learn signs--all beautifully illustrated!--that you and your child can use to enhance your communication and understand more fully what your little one wants and needs. Parenting expert Monica Beyer provides you with 30 new pages of content, including new signs, photographs, and illustrations, as well as an improved layout (popular signs and opposites, such as on/off, listed first in each chapter). You'll find it easy to navigate and begin signing right away. On top of that, you'll find tips and activities to keep you and your child motivated, so that sign language becomes a welcome part of your daily life! Monica Beyer is a mom of four and author of Baby Talk and Teach Your Baby to Sign. She writes for SheKnows, Pregnancy and Baby, and allParenting, and is an editor for Mommalogues. Her main areas of focus are baby sign language, attachment parenting, breastfeeding, co-sleeping, and baby wearing.